Kang has no powers aside from his advanced weaponry and technology. Kang is however a genius, a brilliant military strategist and an expert in hand-to-hand combat. Enhanced Abilities: Kang has super human strength and endurance thanks to his armour. Aging: Kang is over 70 years old chronologically, but has managed to stop his aging completely using his far-flung futuristic technology. Thus he appears to be a man in his mid-40s. Body Armour: Kang wears full body armour that provides him with some protection from physical attacks. Force Field: Kang’s armour has a force field that provides near invulnerability to physical and energy attacks. Resistances: Kang’s armour’s life support systems provides resistance to Corrosives, Toxin and disease. Kang does not need to eat or sleep when in his armour. Blasters: Kang has blasters built into his gauntlets. They can project force or energy blasts. Anti-Gravity Device: Kang has a device in the gauntlets of his armour that allows him to render objects weighing up to 2.2 tons weightless. Time Travel: Kang's armour can create temporal divergences, giving him the ability to travel through and manipulate time. Hover Pad: Kang has often made use of a hover-pad in his battles. Body Transference: Kang employs nano-technology in his helmet's circuitry that enables him to transfer his mind into a new body at the moment of death. Technology: Kang has access to a vast amount of advanced technology and weaponry that he utilises to conquer worlds. Time Ship: Kang has a time ship which he uses to travel between from era to era. Nathaniel Richards was born in the calendar year 3000 of the alternate timeline Other Earth. Bullied as a youth, his throat was slit by a bully, Morgan, and he was hospitalized for a year. Recovering, he studied science and his ancestor's history tapes of the heroic age of Earth-616, growing into a man of adventure in a time of complacency. At age 25 he discovered his ancestor's fortress and time machine. Following encounters with alternate Earth Fantastic Fours seeking to thwart his future self, which faded from his mind, Richards constructed an immense sphinx-shaped ship and travelled to Egypt circa 2950 BC. The ship crashed, blinding and stranding him there, but he subjugated the natives with his technology. He forced the natives to procure for him a radioactive herb which would restore his sight, then, as Pharaoh Rama-Tut, he ruled as a god for a decade. Eventually, a struggle with the Fantastic Four, forced Rama to flee that time period. En route to the future, a "time storm" diverted Rama to the modern era and an encounter with a space-lost Dr. Doom. Inspired by Doom, he took the armoured identity of the Scarlet Centurion, travelled to another timeline (Earth-689) and duped its Avengers into neutralizing all their fellow heroes so he could rule; but he was defeated by the visiting Avengers of Earth-616 and cast outside time. 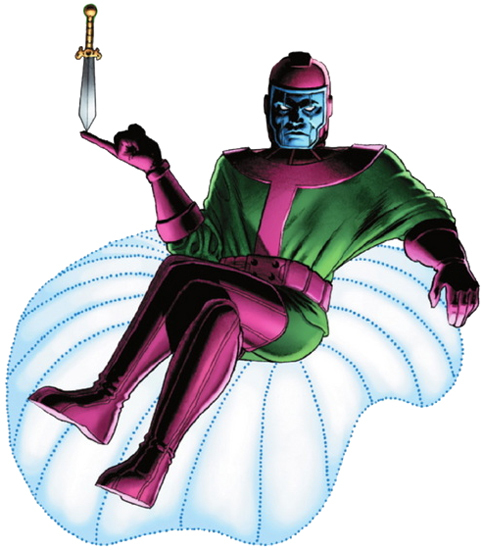 Following this defeat, he reinvented himself as Kang the Conqueror, and carved out a star-flung empire in his home universe. Kang then travelled to the 20th Century of Earth-616, seeking revenge upon the Avengers.